On March 11th, 1892, the Redlands Facts newspaper announced, “V. R. Barker, late from Harwinton, CT, has bought the block in Lugonia Park on the corner of Grove and Sylvan boulevard for $4000… Mr. Barker will set out the tract to oranges and build a delightful home there.” Virgil Barker and his wife, Ellen, purchased the 8-acre property from early Lugonia developers, George Cook (also from Harwinton, CT) & A. L. Park. For many years, Cook and Park had been holding the parcel on the banks of the zanja for use as a city park, but such plans never materialized. In 1892, Lugonia Park was a very desirable address. In addition to Grove St. and Sylvan Boulevard, Barker’s block was bounded on the west by Cook St., and on the north by Park Avenue and the Santa Fe railroad tracks. To the northwest, the Stillman ranch was on the site of the University of Redlands. The Cook residence was to the west and the Feraud residence was a few blocks to the east. The Barkers completed the house and barn in April 1892 and lived there until 1907. The next owners, Frank and Flora Bosserman, resided on the ranch with their sons until 1920. By 1925 it was the residence of orange grower Frank S. Gunter and family. By 1938, Barker was a city councilman and the Barker’s two oldest children had graduated from the University located across the boulevard from their home; and son, Sanford, was principal of the Yucaipa joint union school. In addition to being an active member of the First Baptist church, Mrs. Gunter served on the Hospitality Committee for the Golden Jubilee celebration. Lawrence Nelson relates in his 1963 book Only One Redlands, that though recreation had greatly changed in town, “Redlands never lost its liking for fine horseflesh,” for in 1940, the Kellogg Arabian horse farm (now part of Cal Poly Pomona’s campus) was sent a scroll and a letter from Redlands signed by F. S. Gunter, who was now mayor of Redlands. The letter thanked “King John” for the “beauty and form” of the steeds representing Redlands in the ‘De Anza Days’ parade at Riverside. Gunter later became vice-president of Redlands Foothill Groves. The Gunters lived in the home until 1947, and the former mayor died in 1960. The ground plan of this two-story Queen Anne home is a front-facing ‘T’ with a one-story kitchen attached to the south side. The enclosed utility or laundry porch was added onto the kitchen wing sometime later. The house is constructed entirely of wood. The horizontal clapboard siding and patterned wood shingles are separated by a contrasting belt course. The roof is cross-gabled, with each of the gables shingled in two different patterns, also separated by bands. Decorative shingle patterns in the gables include chisel, diamond, octagonal, square and diagonal. The entrance to the home is from the stairs on the northeast corner of the building. The full-width, one-story porch facing the zanja extends along the front and both sides of the house with eight turned spindle porch supports. Between the supports there are decorative cut-out brackets, some in a quatrefoil design. That same design matches the brackets on the Feraud home a few blocks to the east. The windows are 2-sash, double hung with simple casings. There are two brick chimneys – one on the ridge of the primary roof and one on the ridge of the one-story kitchen roof. There are attic vents in the peak of each gable, and the south elevation features a shed dormer on the second story. The eave overhangs are boxed, and corner boards frame the structure. The Thetas have a wonderful outdoor seating area dominated by a river rock barbeque. A painted boulder proclaims “9 All Night” to passers-by on Grove Street. The orange grove and barn have long disappeared, but the railroad tracks and a lone weir box, both relics of a once-thriving citrus industry, remain. 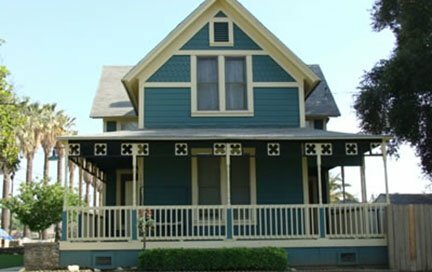 The Redlands Area Historical Society is pleased to present this award to the University of Redlands for preserving this important home.